Over 50 years of producing high quality cylinders and pistons for Harley-Davidson® Motorcycles! 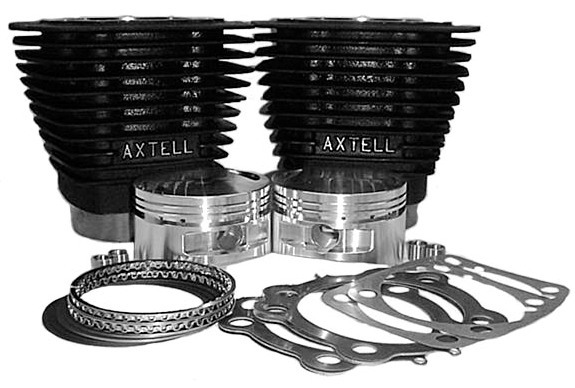 Our specialty is high-performance top end products for American V-Twin motorcycles. We have thousands of satisfied customers; riders just wanting to put an edge on their bike, riders who want to take it to an entirely new level, and professional all-out racers who use our products because they make big, reliable power race after race. Our products have set hundreds of performance records and milestones. In dragracing, our cylinders have been the first in the 10's-9's-8's-7's and 6's. Axtell and Dytch have had a large presence at Bonneville from the Cal Rayborn piloted streamliner to Aaron Wilson using our aluminum street cylinder to break 200 m.p.h. We are a small company that basically custom machines all of our cylinders to match the needs of the customer. We try to shelf stock many of the common combination but in reality most of the time we know the customers name when we start working on the blank castings. Every Axtell cylinder is serial numbered and quality checked and clearances can be suited to the customer needs. Our cylinders are engineered to be strong and stable which is paramount when making REAL POWER. Since we custom manufacture the majority of our cylinders it makes it impossible to "catalogue" and assign part numbers to every possibility. For that reason we created the Axtell Mountain Motor line which is custom tailored to your needs. If you don't see what you want in the site call and we will try to work up a combination for you. This is a brand new product designed and developed by the Axtell Mountain motor team. With the stock OEM oiling system configuration when oil pressure becomes excessive it is bypassed from the high side of the feed to the low side...basically "looping". This causes aeration of the oil and many negatives. Aerated oil is spongy and causes lifter ticking. Also being spongy it results in an oil pressure drop that will cause the piston oilers to shut down. When this occurs engine heat builds and piston & ring life is shortened. Our system directs the bypassed oil into the cam chest to be returned to the oil tank eliminating the "loop". Results: higher oil pressure at low engine rpms. longer oil life due to reduced oil shear,lower oil temperature, improved valve train control and noise. Higher 11.5 compression for hi-output engines. Complete with rings, pins and keepers. 9.7cc dome. This 102ci cylinder kit is the perfect upgrade for your 96ci engine. The cylinders are designed to fit in your existing 3 5/8 bore crankcases. Kit comes complete with flattop forged pistons and head and base gaskets.